Cloud computing has been an industry buzzword for some time, and rightly so—cloud computing is a smart option for any small business. In fact, the number of small businesses using cloud computing is expected to grow from 7% to 10% by the end of 2011. But before diving into all the reasons why your small business should be in the cloud, let’s define what cloud computing is. Security – A common misconception about cloud computing is the fact that its security can be easily compromised. With a technology that relies on the World Wide Web as its means of housing, hackers are a concern for many business owners. The reality of security in the world of cloud computing is this – unlike the case of isolated data centers, cloud computing gives you the opportunity to place your eggs in multiple baskets, instead of just one. So if one basket fails, you will have others to fall back on. The modular nature of cloud computing can actually protect your valuable information from malicious attacks. Lowered Costs – In this economical downturn, businesses of any size are heavily focused on reducing costs wherever possible. Cloud computing can be much cheaper than the upkeep of a company’s own physical servers, and also eliminates the upfront capital investment in costly servers. Plus, many cloud-computing services offer a pay-as-you-go business model, lowering the monthly cost for users. Remote Access – By living on the web, cloud computing enables on-the-go collaboration. With services like BaseCamp and Apollo, project management is a snap – anywhere, anytime. Green Computing – By moving your entire computing infrastructure to the web, your business’ energy consumption will be greatly reduced. The need to power and cool massive servers and storage drives is eliminated, which reduces your company’s environmental impact – plus, you’ll save a little extra green on your energy bills. Ease of Implementation – You’ve created a Facebook account, right? Well, getting your business up and running in the cloud takes about as much time. With cloud computing, you won’t have to spend time installing all of the hardware and other messy components that you need to manage a physical data center. That leaves a lot more time for you to focus on what you do best – running your business. So, that leaves us with one question. 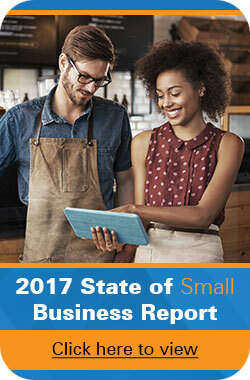 Will you and your small business be using the cloud this year? Share your thoughts in the comments. Your friend makes an interesting point. Privacy is becoming an increasingly important issue – from Google and Yahoo mail accounts, to web searches, and Facebook.